Carl Paul Nassib (born April 12, 1993) is an American football defensive end for the Cleveland Browns of the National Football League. He was the 65th overall pick in the 3rd round of the 2016 NFL draft. He played his college football the Pennsylvania State University for the Penn State Nittany Lions football. 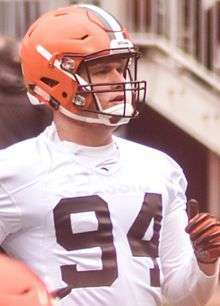 Nassib attended Malvern Preparatory School in Malvern, Pennsylvania, where he was a three-year letterman in football. He played as an offensive tackle and defensive end. He helped lead Malvern Prep to a 7–4 record in both his junior and senior years. Nassib also lettered twice in basketball and three times in track & field. As a senior, he was selected team captain in basketball, helping lead the Friars to a 24–7 record and an Inter-Ac Championship. Nassib joined the Penn State University as a walk-on in 2011. After not playing his first two years, Nassib played in 10 games as a sophomore in 2013. He recorded 12 tackles and one sack. As a junior he appeared in all 13 games and had seven tackles and one sack. He became a starter for the first time his senior year in 2015. Nassib reached 10 sacks in only six games to start the year. Because of his stellar 2015 season, he was named the Big Ten Nagurski-Woodson Defensive Player of the Year for 2015, was presented with the Hendricks Award for the nation's top defensive end, and also given the Lombardi Award for being the best college football lineman or linebacker. Nassib was also a finalist, for several other awards, including the Nagurski Trophy, the award given to the best defensive player in the country, along with the Burlsworth Trophy given to the nation's best player who started their career as a walk-on. USA Today honored Nassib as a Second-Team All-American. Nassib was selected by the Cleveland Browns in the 3rd round of the 2016 NFL draft with the 65th pick. On June 28, Nassib signed a four-year contract worth about $3.2 million, with signing bonus worth approximately $890,000. In his first game as a professional, against the Philadelphia Eagles, Nassib recorded one sack, three tackles, and one defended pass, and earned a nomination for Pepsi NFL Rookie of the Week. Carl is the son of Mary and Gilbert Nassib. His father, Gilbert Nassib, played college football at the University of Delaware. He has four siblings, including two brothers, John and Ryan, and two sisters, Carey and Paige. Ryan, who is 3 years older, played college football for Syracuse University and currently plays quarterback for the New York Giants. John, who is 2 years younger, is also a 6'7" defensive end and is in his sophomore season at University of Delaware. ↑ "Former walk-on DE Carl Nassib blossoming into a star for Penn State". ESPN.com. ↑ The Morning Call (April 19, 2015). "Penn State defensive end Carl Nassib shines in spring drills – The Morning Call". themorningcall.com. ↑ "Weight room, Chipotle changed Carl Nassib from walk-on to sack leader – Big Ten Blog- ESPN". ESPN.com. ↑ "Former walk-on Carl Nassib hasn't looked back after Bill O'Brien's surprise scholarship offer". PennLive.com. ↑ "Carl Nassib: From Malvern Prep to probable Penn State starter". philly-archives. ↑ "Nassib's path to becoming a starter for Penn State a success story". Reading Eagle. ↑ Bob Cohn (August 10, 2015). "Long wait over for Penn State fifth-year senior Nassib". TribLIVE.com. ↑ "Rich Scarcella: PSU defensive end Carl Nassib one of nation's best". Reading Eagle. ↑ "View 2015 All-Big Ten Defensive Team & individual award winners". Big Ten Network. ↑ "Oklahoma Sooners QB Baker Mayfield wins Burlsworth Award". ESPN.com. ↑ "Temple's Tyler Matakevich named Nagurski Trophy winner – CollegeFootballTalk". CollegeFootballTalk. ↑ "NFL Events: Combine Player Profiles - Carl Nassib". National Football League. ↑ Cabot, Mary Kay (April 29, 2016). "Carl Nassib drafted by Cleveland Browns with No. 65 pick". The Plain Dealer. Retrieved August 28, 2016. ↑ Cabot, Mary Kay (June 29, 2016). "Browns sign 3rd-rounder Carl Nassib, whom they think has a motor like Joey Bosa's". The Plain Dealer. Retrieved August 28, 2016. ↑ "Pepsi NFL Rookie of the Week". NFL.com. September 13, 2016. Retrieved September 16, 2016. ↑ "Penn State Nittany Lions:Carl Nassib". Archived from the original on October 8, 2015. ↑ "Delaware Blue Hens football:John Nassib".